Amerimed CPR Training / CPR in the News / AmeriMed Supports Team Rubicon! Please consider joining with AmeriMed CPR Training in supporting Team Rubicon by donating. 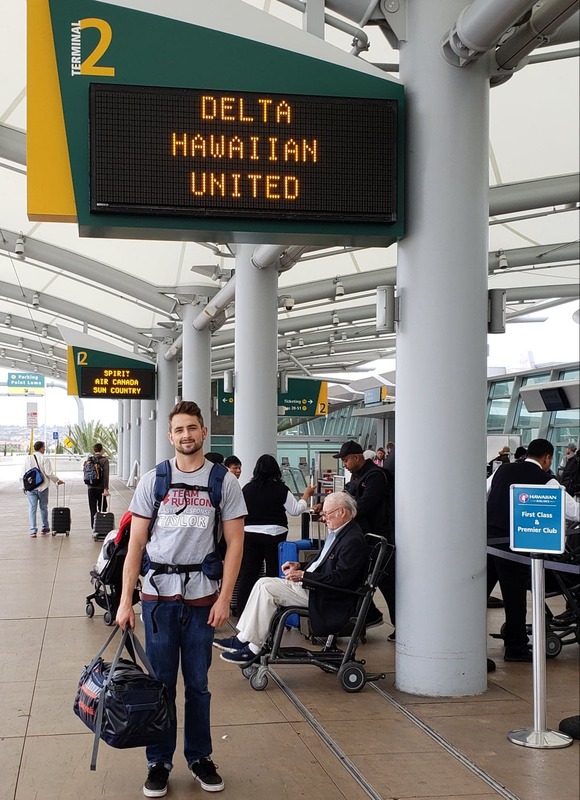 In addition to the monthly financial support we send to Team Rubicon, our instructor, Taylor Gallagher, is currently in North Carolina volunteering his skills in the Hurricane Florence disaster relief efforts. Below is a photo of him as he boards his flight from San Diego International Airport on 10/6/18. All Team Rubicon services are provided free of charge. In 2016, 62 percent of all homes Team Rubicon serviced did not have home insurance. An American Progress report noted that the most extreme weather events typically harmed counties with household incomes below the U.S. median annual income of $51,941. Wildfires, tornadoes, and severe thunderstorms devastated areas with households that earned on average three percent less than the U.S. median income. It is easy to imagine the positive, long-term impact Team Rubicon’s free assistance provided to these families. When disaster strikes, Team Rubicon works hard to help the most vulnerable in need. By working with or alongside local agencies and governments, Team Rubicon seeks to be of the utmost service to those in need. No two disasters are alike. Each require a different approach and skill-set. Team Rubicon offers a wide range of capabilities to best serve communities in need. Effective disaster response comes from effective training and preparedness. While many of the skills provided by the military – trauma medicine, leadership, logistics – translate well, Team Rubicon offers training to equip members with valuable skills. Team Rubicon has deployed across the country and world to assist communities in need. This integrated set of plans and manuals bring together the best practices of emergency management, disaster risk reduction, and military humanitarian assistance/disaster relief operations. Adaptable, scaleable, and practical, they provide TR leaders the techniques necessary for engaging in relief operations of any scope or scale.